The Hawaii Play Fairway project was funded by the U.S. Department of Energy Geothermal Technologies Office (award DE-EE0006729). The project comprises three phases and a total of $1.5M. In Phase 1 of project, existing geologic, groundwater, and geophysical datasets relevant to subsurface heat, fluid and permeability were identified, compiled, and ranked. A statistical methodology to integrate these data into a resource probability map was developed. The results of this probability analysis, in addition to an evaluation of confidence in the probability value, as well as considerations of development viability, led to the identification of 10 locations for exploration activities on the islands. 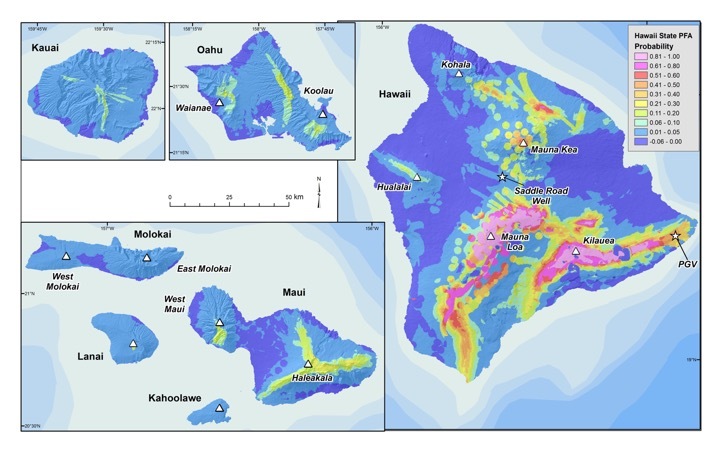 Phase 2 of the project involved the collection of new groundwater data in 10 locations across the state, and new geophysical data on Lanai, Maui, and central Hawaii Island, as well as modeling of topographically induced stress – the last to better characterize subsurface permeability. Phase 2 data were incorporated into an updated resource probability map. Results of the DOE Phase 1 geothermal play fairway probability analysis for the State of Hawaii. Probabilities of a geothermal resource are colored. Areas with restricted land access are shown in stippled and crosshatch patterns (e.g., National Park lands, protective conservation districts, and urban areas). Red boxes outline areas proposed for Phase 2 study. White triangles indicate the calderas of the main shield volcanoes. White stars mark the locations of the Saddle Road well and Puna Geothermal Venture (PGV). As of this writing (February 2018) we are in Phase 3 of the project, which has a goal of obtaining scientific data from a test well. 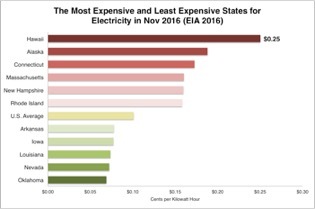 Electricity prices in the State of Hawaii are the highest in the US and about double the national average, in part due to the fact that roughly 80% of Hawaii’s energy is from imported petroleum. The Hawaiian Islands are volcanic in origin, yet the extent of the State of Hawaii’s geothermal resource is largely uncharacterized. A statewide geothermal resource assessment published in 1985 found a potential resource on all islands (Thomas, 1985). Since then, little additional exploration was conducted, until this Play Fairway project. 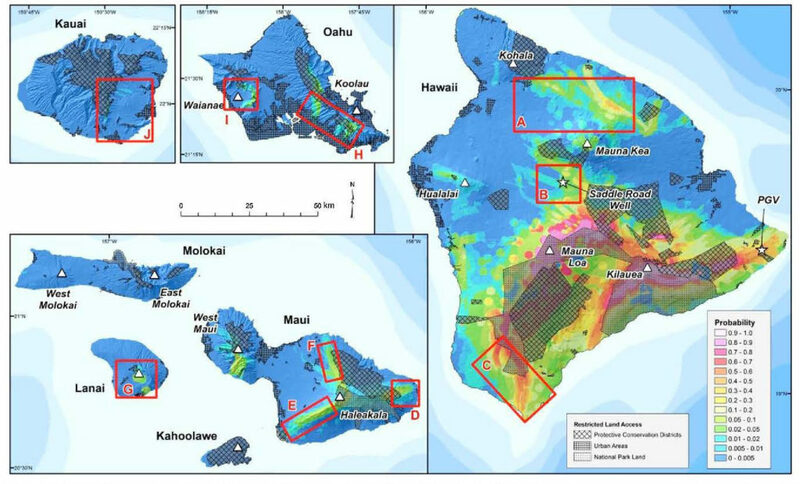 Our results have provided a major step forward for the State of Hawaii through providing an updated resource assessment, a roadmap for additional exploration activities, and the identification of target sites for drilling. Please see our papers and conference proceedings for further details. Thomas, D.M., 1985, Geothermal resources assessment in Hawaii: Final report: Hawaii Institute of Geophysics Technical Report HIG-85-2, 115 p.